The first step to creating something is to imagine it. Andrea Steves and Timothy Furstnau knew that when they decided to design a museum about capitalism. One of the purposes of art is to reflect society back to ourselves. It gets really interesting when we start to really observe the core designs of our world. As capitalism hurtles towards what appears to be its culmination—near total accumulation on the part of a few and destruction of the commons—the museum invites us to think beyond that end. To bring the idea to life, another unimaginable thing happened: A foundation sought “daring proposals that other foundations typically wouldn’t fund.” Heather Pontonio, Art Program Manager at the Emily Hall Tremain Foundation, said, “If it would [otherwise] be funded, it’s probably not challenging enough.” We’ll leave that one right there. The Museum’s collection of artifacts is ongoing. 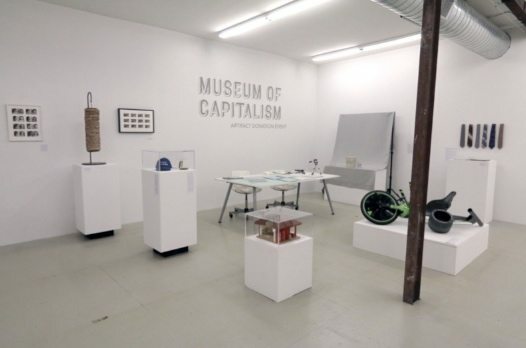 It seeks donations of “objects, documents, and other artifacts from the era of capitalism” and hosts periodic Artifact Donation Events in different cities “where community members are invited to bring artifacts of capitalism.” The most recent one was in St. Louis in March 2016. People can contact the museum to alert them to or donate an artifact, or to host an event in their city. A series of order forms for gold teeth, with shimmering spray paint and cheap gem stickers embellishing the anatomical diagrams of teeth. But Barnette describes gold teeth as one of the tools of black visual culture for surviving capitalism—a tool for “making yourself feel like you’re worth more than society tells you that you are,” she says. The location of the Museum itself is part of the story. Oakland’s Jack London Square “has been plagued with storefront vacancies for the past decade—and is eerily deserted on most days of the week,” but the developed waterfront area was originally envisioned as a tourist destination. As Artsy notes, “fittingly—or perhaps ironically,” the Museum hosts a gift shop. Nevertheless, the curators explained that two goals of the Museum are to invite visitors to imagine alternatives to capitalism and to recognize how we perform capitalism in our everyday lives, even when we’re critiquing it.